School begins again next month to the joy of many parents. Whether your kids are seasoned school veterans or they’re new to the system they can always pick up a few extra tips to help them out for the new school year. 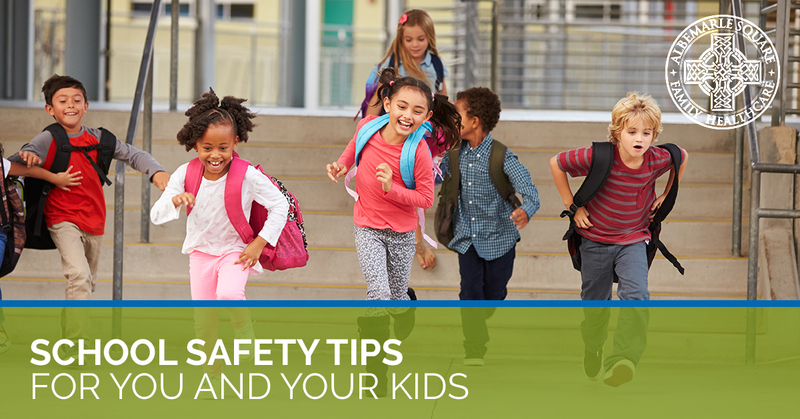 Here are a few safety tips you can practice with your children today to make sure they’re well on their way to getting an A long before they even pick up a pencil. School can be an intimidating environment, especially for students entering a new school. Before they start classes see if your family can take a tour of the school. Go through the halls, into the classrooms and around the campus so your student knows exactly where they’ll have to go when that first bell rings. If your child is walking home from school then make sure they know the quickest and safest route home. Take them on walks or bike rides, point out landmarks or points of interest and let them know where to go in case of an emergency. Much like schools and companies have emergency evacuation plans, you and your family should too. Make a plan, run through scenarios and make sure your children understand exactly what to do in any emergency situation. Make sure they know who to call, who they can go to and what they can do in case of a weather emergency, medical emergency or stranger danger. Also be sure to update any and all contact and emergency contact info, such as your pediatrician, family members, etc., with your school and be sure your children have the same numbers should they need them. Like any healthy relationship, communication is integral. Talk with your children before and after school. Make sure they know their emergency contacts are and how to reach them. Know where they’ll be before and after school if you don’t drop them off and pick them up. Ask them about their friends and their interests and let them know that, if they find themselves in a situation they aren’t comfortable in, they can always say no and contact you or the nearest adult for help. If you feel it would be better for your child to talk to a professional, our pediatricians at Albemarle Square Family Health are always willing to help. If your child does walk home, see if there are other students in the area that they can walk with. Some schools may even have a safe walk program where adults or police officers will help students get home safely should they want or need it. Also let your children know who to contact if they or their friends see something suspicious. If you or your children and their friends see any kind of suspicious behavior, bullying or inappropriate activities while on school grounds don’t hesitate to inform someone. We here at Albemarle Square Family Health know that school and everything along with it can be a stressful time for everyone. If you feel like you or your children need to speak with a licensed professional about anything you can always contact us and set up an appointment with one of our great physicians. Our pediatricians and mental health experts will get you and your children back to A+ health in no time.